Shirts With Random Triangles: A.J. McCarron named "Hottest College Football Player" by Seventeen. A.J. McCarron named "Hottest College Football Player" by Seventeen. Seventeen has released it's list of the twenty-five "Hottest College Football Players" online. Topping the list: Alabama starting quarterback A.J. McCarron. 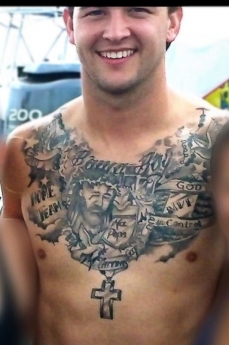 Whether or not Seventeen knows about McCarron's notorious chest tattoo is unknown, nor whether hotness points would be taken away if they did. The list also includes McCarron's Alabama teammate, linebacker C.J. Mosley, along with Ohio State QB Braxton Miller (no. 6), Georgia QB Aaron Murray (no. 7), and Texas A&M QB Johnny Manziel.